A loose companion project to Michael Mayer's iconic mix series, the IMMER vinyl releases never fail to surprise: it's here that the Kompakt label head opens up the vaults of his record collection and shares some of his secret favorites – to put a spotlight on those great tunes that never got the recognition that they should have in the first place. Following the re-release of lost gems from such diverse artists as Benjamin Diamond, Losoul or Psychonauts, the fifth instalment in the IMMER 12“ series presents two sublime cuts from SCSI 9 and REBOTINI – each one of them a prime example for Michael Mayer's unique ability to sense and unlock the hidden potential of a track. For a DJ like Michael Mayer, a track never just stands on its own – it's the context of the mix that gives it meaning, as it becomes embedded in the narrative arc of a grander scheme. 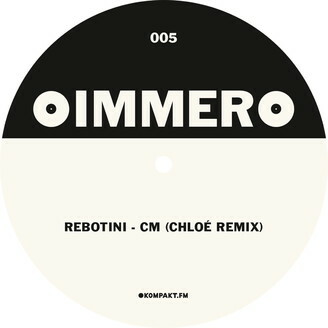 With this background in mind, one quickly understands how the classy CHLOÉ REMIX of REBOTINI's cut CM got on the record: constantly moving forward, the piece certainly knows where it's going - but stays open for any sonic scintillation along the way. Originally from a 2009 release on Citizen Records, it boasts deceptively simple chords sitting on a tightly executed rhythm foundation - a perfect match for the powerful minimalist electro of the Black Strobe co-founder and Chloé's dark and sensual textures. The flipside sees the return of a well-known name in the Kompakt universe: legendary Russian producer duo SCSI 9 made quite a splash in the early Aughties, when a new sensibility for warmth and melody turned the ruling techno paradigm on its head - and ANGEL is a particularly atmospheric representative of that first wave of electronic 21st century blues. A cut brimming with hypnotic loops and dreamy textures, this operates as a mindful conversation between a few distinct elements brought together for a surprisingly cohesive result – first released in 2001 on defunct Berlin imprint Salo, it's a strong-willed and emotive piece of music that nevertheless keeps its cool, patiently waiting to be discovered for the right moment on the dance floor. That time is now.